CHICAGO – HANNOVER MESSE USA 2018, the first staging of the iconic HANNOVER MESSE brand outside of Germany, presented game-changing Industry 4.0 solutions over six days during its co-location with IMTS 2018 at McCormick Place in Chicago from September 10-15. HANNOVER MESSE USA 2018 covered more than 114,200 square feet of exhibit space and featured 510 exhibitors who showcased their innovations to a record breaking 129,415 registered visitors attending both shows. The event’s exhibition and conference space grew 443 percent from the first trade show launched alongside IMTS 2012. HANNOVER MESSE USA 2018 increased exhibition space 26 percent compared to the co-located shows at IMTS 2016. More than 80 percent of this year’s exhibitors have offices outside of the U.S.
With its prominent position in IAMD USA 2018, Beckhoff showcased its latest smart factory hardware, software, EtherCAT and TSN (Time-Sensitive Networking) solutions. Beckhoff introduced several products to the North American market during the show this year, including its new EK1000 EtherCAT TSN Coupler that combines the advantages of the EtherCAT ecosystem with TSN networks to boost communication in industrial environments. The company also unveiled two new ultra-compact Industrial PCs that deliver maximum processing power for complex automation applications. “HANNOVER MESSE is a globally recognized brand and with its introduction in the U.S. it brings an intense focus on automation and control technologies to the North American manufacturing industry,” said Shane Novacek, marketing communications manager at Beckhoff Automation. “Since the co-location of the show with IMTS 2012, Beckhoff has continually and enthusiastically supported the event both on the show floor and as a sponsor/presenter at the Global Automation and Manufacturing Summit held in conjunction with HANNOVER MESSE USA 2018,” added Novacek. Beckhoff also noted that it increased overall new business lead count by more than 40 percent at HANNOVER MESSE USA 2018 compared with its participation at the trade show co-located with IMTS 2016, which it still regards as a highly successful trade show. 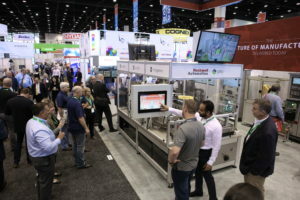 “Our participation at HANNOVER MESSE USA focused on bringing the Connected Enterprise to life to help foster strength in the future of manufacturing,” said Reid Schook, global OEM segment business manager, Rockwell Automation. “We utilized the introduction of the HANNOVER MESSE brand in the U.S. to highlight strategic partnerships with both Fanuc and PTC. Alongside our partners, we showcased how to deliver integrated solutions, tools and capabilities to make the digital factory a reality for our customers,” added Schook. During IAMD USA, Festo, a leading manufacturer of pneumatic and electromechanical systems, components, and controls for process and industrial automation, introduced its new electric actuators, ELGC and EGSC, which are ideal for applications where compact dimensions are essential. These electric axes can be combined into space-saving handling applications that fit seamlessly into assembly, testing, inspection, small parts handling and desk top systems and feature a common system approach and platform architecture, as well as space saving adapter-free connectors. Festo also exhibited its new VTEM Motion Terminal, a modular Industry 4.0 device – a single unit capable of replacing 50 different components through the download of various combinations of cloud-based apps. “HANNOVER MESSE USA 2018 allowed our existing customers and new customers to see firsthand our product portfolio for one-on-one demonstrations and top-line discussions,” said Kristine Inserra, director of marketing communications North America at Festo. “We were thrilled by the number of exhibitors and visitors. The show exceeded all expectations for new business development,” added Inserra. Exhibiting in the Industrial Supply trade show, Thoni Alutec, the largest aluminum foundry in Europe with locations in Poland, Mexico and India, showcased its complete casting solutions utilized in a variety of engineering applications. Thoni Alutec manages a green production philosophy and serves many industrial markets, including aerospace, renewable and fossil energy, power generation, robotics & process machines, medical and automotive to name a few. “Thoni Alutec is a longtime exhibitor at HANNOVER MESSE in Germany. We decided to exhibit at the first HANNOVER MESSE USA to showcase how we can support the North and South American industrial markets casting needs,” said Piotr Kasprzyk, technical sales manager of Thoni Alutec. “We were pleased with the new business opportunities we uncovered at the show and look forward to returning in 2020,” added Kasprzyk. SAP’s showcase in the Digital Factory demonstrated The Network of Digital Twins in action and turned the spotlight on SAP technologies that allow smart manufacturers to implement modular production, reduce equipment downtime and increase customer retention. 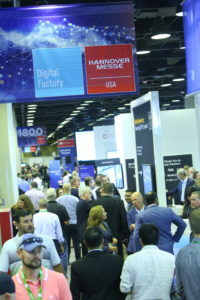 “Following an outstanding experience exhibiting at HANNOVER MESSE in Germany this April, SAP brought its resources, references and pipeline of successful Industry 4.0 and intelligent product design solutions to HANNOVER MESSE USA 2018 to address North American manufacturers’ challenges,” said Sayan Bose, global director of industrial machinery & components, Industry Business Unit of SAP. “Not only were we able to connect with North and South American manufacturers during the U.S. show, we also extended our reach to a host of global attendees in the industrial manufacturing machinery and components space. Overall, HANNOVER MESSE USA 2018 proved to be an amazing platform to showcase SAP’s innovations for the manufacturing industry powered by intelligent technologies, including Blockchain, IoT and machine learning,” added Bose. Also, in the Digital Factory space, Dell launched a new IIoT solution developed in collaboration with Intel and Tridium specifically built to increase plant floor efficiencies for low-volume, high-mix discrete manufacturers. This innovative IIoT solution leverages the scalability and power of Dell’s technology components, Intel’s IoT technology for manufacturing and the energy industry and Tridium’s enterprise software. “The Dell/Intel/Tridium platform brings together cutting-edge capabilities from all three companies to provide a complete digital transformation solution that captures, normalizes and analyzes data to produce insights for the diverse plant floor,” said Kirsten Billhardt, marketing director - Internet of Things at Dell. “HANNOVER MESSE USA put our IIoT solution in front of the ideal audience of key decision makers in charge of their plant’s digital transformation, and we look forward to demonstrating this innovative solution at HANNOVER MESSE in Germany next April,” added Billhardt. “The future of digitalized manufacturing and Industry 4.0 rests entirely upon the ability to pool expertise and resources,” said Professor Georg Rosenfeld, member of the executive board of the Fraunhofer-Gesellschaft. “Our interdisciplinary expertise sparks new ideas that meet the challenges of a digitalized world and helps create customized solutions right along the value chain for companies of all sizes. Attending HANNOVER MESSE USA 2018 co-located with IMTS 2018 in Chicago has created a sustainable opportunity to share our ideas with U.S. and international stakeholders,” added Rosenfeld. 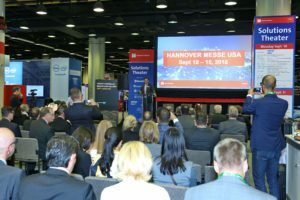 The brand-new Solutions Theater on the floor of HANNOVER MESSE USA 2018 offered all visitors more than 60 educational sessions over five days delivered by top industry experts, educators and key influencers. Sessions covered topics from Industry 4.0 meets IIoT to case studies of Industry 4.0 in practice to an Intelligent Manufacturing Solutions Forum plus a live pitch showcase sponsored by GE Ventures and Sente for start-up companies focused on digital factory technologies. HANNOVER MESSE, the world’s leading industrial technology show launched 70 years ago in Hannover, and HANNOVER MESSE USA are at the forefront of showcasing innovations in the factory of the future: cobots, industrial energy systems, IIoT, Industry 4.0 and related applications such as predictive maintenance, more efficient use of raw materials, faster time to market and other trends in industrial manufacturing. HANNOVER MESSE USA 2020 will be produced alongside IMTS 2020 from September 14-19 at McCormick Place in Chicago.